Unusual DX You Can Try For! We amateurs rely on a lot of patience and a little luck to snag rare DX. But pros often have to establish a reliable radio link between two distant stations, and many times that link must be established in a matter of minutes. How do they do it? The answer is a device called an ionosonde. Military and scientific users of the short-wave band use them regularly to establish radio links and to probe ionospheric conditions. 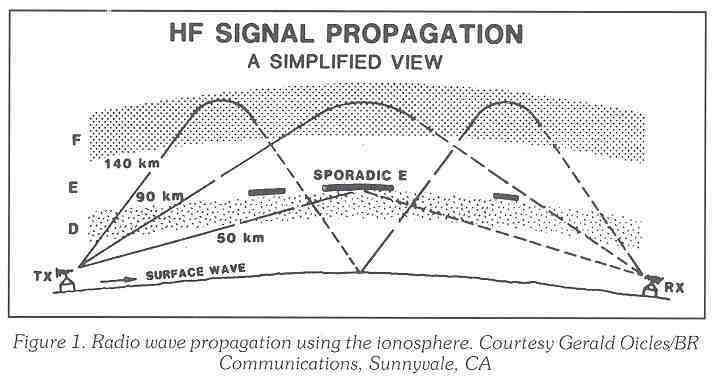 I'll describe what ionosondes are and how you can listen for them, but first let me digress for a brief review of the ionosphere and its role in radio propagation. The ionosphere (Fig 1) is a layer (several layers actually) of charged particles that surrounds the Earth. The charged particles come from sunlight (ultraviolet radiation and X-rays) that ionizes, atoms and molecules in the upper atmosphere. The ionosphere has the fortunate property that it can refract and reflect radio waves. Two stations separated by a great distance on the Earth can use the ionosphere to communicate over the horizon, since the radio waves traveling between the stations can bounce off the ionosphere. The ionosphere is composed of three principle layers. The bottom-most is the D-region, which is about 30-60 miles above the Earth's surface. The D-region is mostly responsible for absorption of radio signals. Next up is the E-region at about 60- 90 miles. Usually the E-region doesn't affect radio waves very much. Occasionally a very thin, dense ionized layer forms here. This layer, known as "sporadic E," can cause strong reflection of radio waves at frequencies up to VHF,and beyond. The F-region is all of the ionosphere above about 90 miles. It is quite good at refracting radio waves. That is, an upward traveling wave is gradually bent by the F-region until it is traveling back down towards Earth again. The F-region is the layer which is most responsible for long-distance short-wave propagation. Radio waves can bounce off the ionosphere more than once. Such "multi-hop" propagation occurs when signals reflect or refract off the ionosphere to be reflected/ refracted again, and so on. In this fashion specific frequency? Enter the ionosonde! Short for "ionosphere sounder," the ionosonde is actually a very simple device. The ionosonde transmitter emits a narrow bandwidth, low power (10-150 watt) signal that sweeps in a frequency across the short-wave band. Most ionosondes start sweeping at a frequency of 2000 kHz, and sweep at a rate of 100 kHz per second up to a maximum frequency of 30 MHz. It takes 4 minutes and 40 seconds to complete one sweep, and most ionosondes repeat their sweeps every 15 minutes (some repeat at other intervals such as 5, 10, 20 or 30 minutes). Table 1 lists a few dozen ionosonde transmitters and their locations, power and start times. These ionosondes, like most, transmit through omnidirectional antennas. 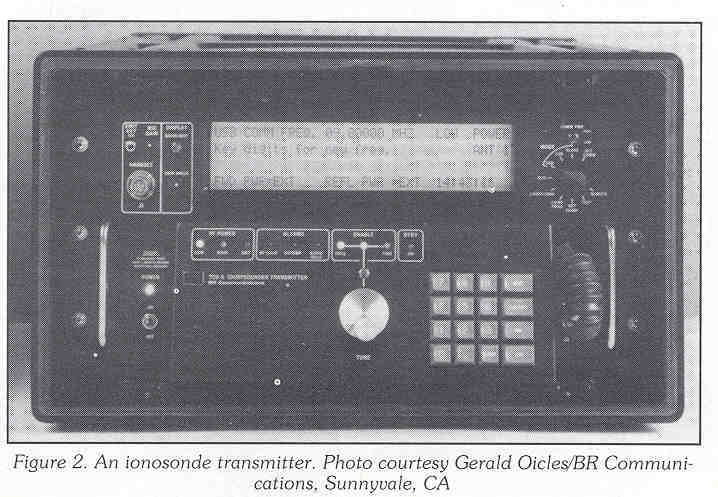 To establish a reliable radio link between two points, an ionosonde transmitter (Fig. 2) is located at one point and an ionosonde receiver at another. 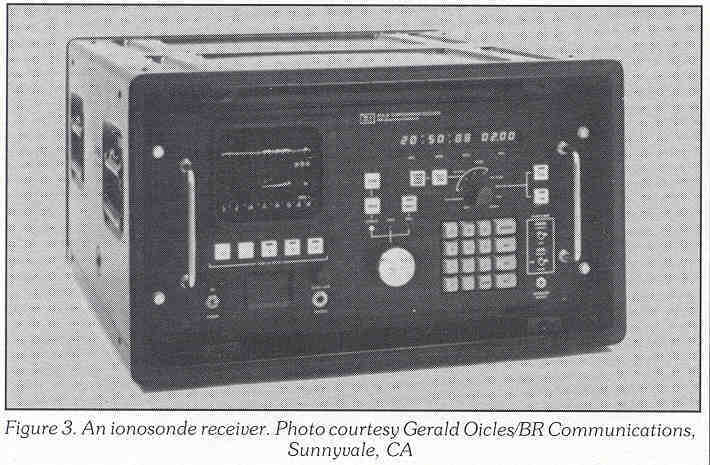 The ionosonde receiver (Fig. 3) is synchronized to sweep at the same time and rate as the transmitter. The receiver records how strong the received signal is at each frequency. At some frequencies the transmitted signal may not be heard at all because ionospheric conditions may be more favorable and the signal may come booming in. The two stations then choose a frequency for the communications link based on the ionosonde results. This technique is used extensively by the military. A command base will operate an ionosonde transmitter and mobile units which must establish a link with the base will use ionosonde receivers in the field to find the best frequency. Once the ionosonde starts sweeping, it takes at most 4 minutes and 40 seconds to establish a link (assuming there are any good frequencies!). A typical "ionogram," as the output of an ionosonde receiver is called, is shown in Figure 5. 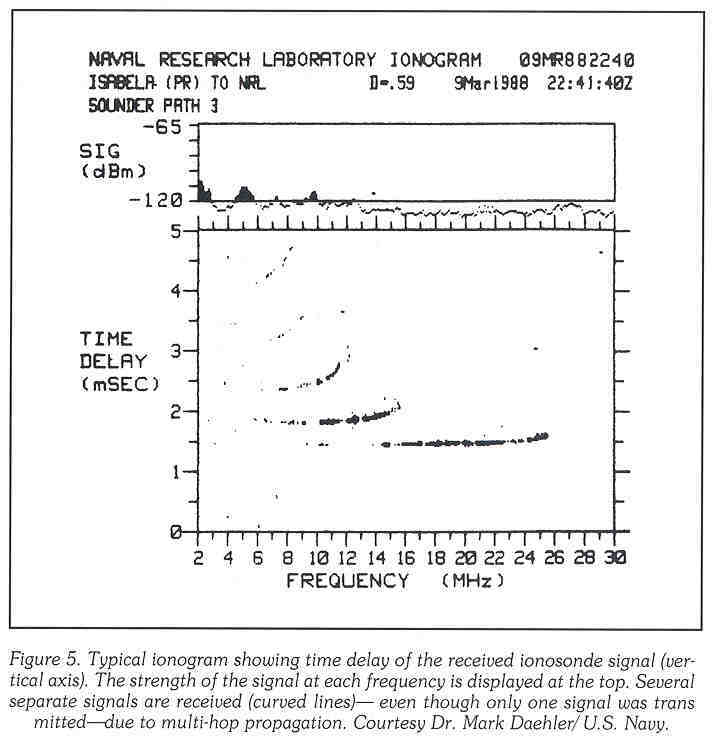 The ionogram records the strength of the received signal, as well as the total amount of time it took to travel from transmitter to receiver (typically a few milliseconds, where one millisecond equals 1/1000 of a second). Occasionally, a transmitted signal may reach the receiver along several different paths, each with a different time delay. This is why more than one signal shows up in Figure 5, even though only one was transmitted. The separate signals appear as curved traces in Figure 5, where each trace records the signal's time delay (vertical axis) as a function of frequency (horizontal axis). The signals that have taken many hops to reach the receiver show up at large time delays since they have been traveled a larger total distance. The strength of all the signals combined is shown as a function of frequency at the top of the figure. The ionosonde receiver automatically ignores normal short-wave signals (i.e., those that don't drift at the same rate as the ionosonde). As the frequency of a radio wave increases, it penetrates higher up into the ionosphere. This is why the trace for an individual signal in Figure 5 curves upwards with frequency. Beyond a certain frequency, called the Maximum Usable Frequency or (MUF), the signals disappear altogether, since the ionosphere is incapable of refracting them back downwards. In Figure 5, the MUF is about 26 MHz. Above this frequency, the signals exit the top of the ionosphere and travel off into space. Is it possible to hear ionosonde signals without a specialized receiver? Absolutely -in fact, it's hard not to! Since most ionosondes operate on a regular schedule, it is a simple matter to compute when they will sweep at 100 kHz per second (1 MHz each 10 seconds) up to 30 MHz. A typical short-wave receiver has a bandwidth of about 3 kHz or so, so the ionosonde signal, sweeping by at 100 kHz per second, can be heard only for a small fraction of a second. You should listen for a brief-but very distinctive-"weep" as the signal sweeps by. The ionosonde signals are generally unmodulated, but it doesn't really matter whether you listen in AM or CW mode-the signal is quite distinctive in either. There are several ways to monitor ionosondes on a normal short-wave radio. One is to pick up a good, interference-free frequency in the 2000 kHz-30 MHz range. Monitor that frequency and write down the times (accurate to the nearest second) that you hear ionosondes sweep by. Work back- ward to compute their start times and com- pare to Table 1. (Fig. 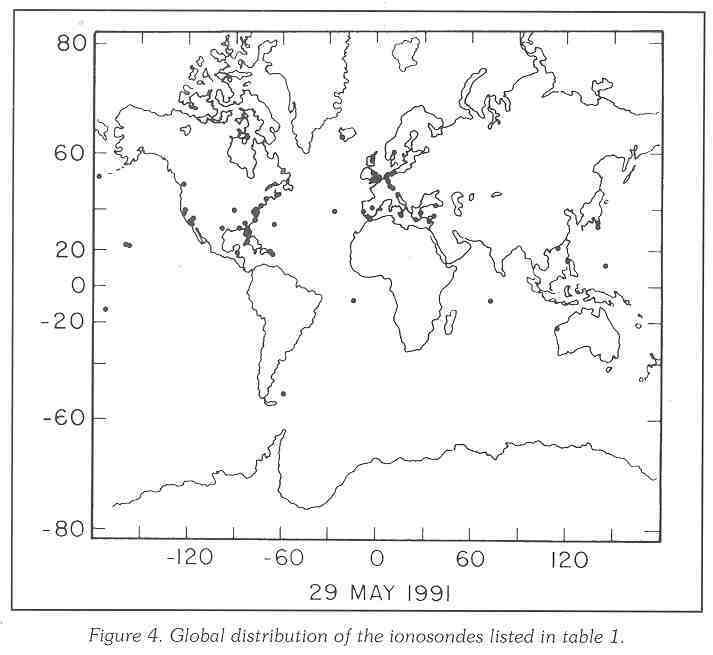 4 Global distributation) Keep in mind that Table I is only a partial list of ionosondes (it is estimated that over 200 ionosondes are in operation), and not all ionosondes operate all the time. Another method is to listen to the WWV or CHU tine signals at 2500, 3330, 5000, 7335, 10000 or 20000 kHz. Write down the times at which you hear ionosondes sweep by (their signal will beat with the signal from the time station). This is a very ac- curate way of timing ionosondes. The time difference between the ionosonde start time and when it sweeps by above frequencies will be (in min:sec format) 00:05, 00: 13.3, 00:30, 00:53.35, oi:20, 02: 10 and 03:00 respectively, for an ionosonde sweeping at 100 kHz per second. Using this technique I routinely monitor the Driver, VA, Camp Lejuene, NC, Bergstrom AFB, TX, Isabela, PR, Newport Comer, Canada, Palhais, Portugal and Falkland Islands ionosondes (among others) from my listening post near Washington, DC. To listen for a particular ionosonde, program several interference-free frequencies (or the time station frequencies) between 2000 kHz and 30 MHz into the memory of your short-wave receiver. Then compute when the ionosonde should sweep by each frequency, and listen to these frequencies in turn at the right time. The ionosonde will be audible at those frequencies at which a good ionosonde path exists, and not at others. This last technique can be used as a real- time check on DX conditions. Say, for example, the ionosonde is clearly heard in the 10000- 15000 kHz range. It may be a good range. Once you know what to listen for, you'll be surprised how often you hear ionosondes, even when you're not trying. If you listen to short-wave for more than a few minutes, you'll certainly hear one or more sweep by. Their 10-150 watt signals are surprisingly easy to hear even over distances of thousands of miles. Avoid the short-wave broadcast bands when listening for ionosondes because the interference level is high. You can often find quieter frequencies in the maritime or aviation bands, such as 3400-3500, 4000- 4438, 5450-5730, 6200-6525, 8100- 9040, 12230-13360, 16360-17410, 22000-22855 and 25070-25210 kHz, to name a few. The radio astronomy bands at 13360-13410 kHz and 25550-25670 kHz are particularly quiet since no transmissions are allowed there. Many ionosondes automatically silence their output in these protected bands, but some don't have this capability. The start times of the ionosondes are accurate to better than about one second or so. To confidently identify a particular ionosondes signal, your clock should be set to WWV (or any other standard time station) to within the same accuracy. Under good conditions you may hear a half a dozen signals sweep by a given frequency within a minute's time. Happy listening! Back to Brooke's HF Propagation, RCS-5A Chirpsounder, home pages. This is the time this page has been accessed since 8 May. 2000.